not so pedestrian of a post after all! this recipe uses the yolks i used for the pavlovas. it pays to have a plan sometimes. additional notes at end of recipe. for the strawberries, vitamix them until smooth as possible. it’ll equal out to about 1 1/2 cups liquid. reduce down in small saucepan on low heat, throwing a few healthy sprinkles of lemon zest. you’re aiming to get as much liquid/moisture out of the mixture as possible, leaving behind a thick sauce. i reduced it down to about 1/2 cup – 3/4 cup — basically until i got tired of babysitting it. for the ice cream base, it’s my usual egg custard base. in a medium saucepan add in 2 1/2 cans of coconut milk, reserving the remaining for later. heat up the milk with the sugar until fully incorporated. add in a few healthy sprinkles of lemon zest. in a small bowl, separate your eggs. whisk the yolks, and then with a ladle pour in the hot coconut milk all the while whisking the yolks. this is tempering the yolks so it doesn’t scramble. if you want, add in another ladle-full. then slowly add in the warmed through yolk mixture into the saucepan, still whisking. you want the mixture to be fully incorporated. keep the heat on medium and keeping mixing until the mixture has thickened, about 10-15 minutes. at this point, with the remaining half can of coconut milk stir in the potato starch, then add mixture to the custard. this will thicken the custard even more, while also preventing full on ice crystals from forming when the ice cream is in the freezer. remove custard from saucepan and allow cool. cover and refrigerate for a few hours, ideally overnight. same thing with the strawberry sauce. when ready, pour custard base into ice maker and churn, then add in the strawberry sauce. churn according to manufacturer’s specs. *note – technically, you could mix the strawberry sauce and custard before adding to the machine but it seemed like a whole lot of mixing and we figured the machine was well capable of doing that step for us. we opted to pour the custard first because there’s a lot more of it than the sauce, and there’s always a thin layer of ice cream along the edge of the canister that is difficult to scrape out when frozen. we figured we could “waste” that layer of mainly custard rather than of the strawberry sauce. this round made about 4 bowls and two good-sized cones. best to consume day of, but if not, store in very air tight and dry container. i bought our waffle cone maker TWO SUMMERS ago and we used it ONCE. oh for shame. my beloved adores ice cream and this is one contraption we cannot allow to gather dust! heat your waffle cone maker to #3. pour batter into it, aim for 1/4 cup (let’s be smart, eyeball it and try not to get greedy) and cook for about 2-3 minutes. check on it after 1 minute, aim for a nice golden brown shade. very quickly and carefully peel the waffle out with a small spatula and shape over a bowl or cup, or into a cone. allow to cool. a trick: i added a few chocolate chips in the bottom of the cone, the residual warm of the cooking melted it a bit and it created a stopper. if you’re a slow ice cream eater, like dw, hopefully no leaks! hello, welcome & thank you! you guys are so lucky to have access to strawberry farms…here i have been eating the subpar kind 😦 love the last photo..
dixya, stop. you guys don’t have strawberry farms?? ok. i just did a quick search here and hopefully there’s a farm nearish to you so you can start picking your own. it’s flipping amazing. That looks incredible! It’s making me wish a) I had a VitaMix and b) that strawberries were out here in Nova Scotia. Not QUITE!! Also, I’ve learned that there is no such thing as too pedestrian a blog post – sometimes the simplest things we make are the most delicious! a vitamix is quite the investment, one that i recommend but a blender would work just fine. This looks great Lan, I bet the coconut milk gives it gorgeous depth of flavour! it really does, since going semi-dairy free, coconut + strawberry has become of my most fave combos. Woah those sound amazing! Very “intense” indeed. 🙂 Great flavor combinations too! That looks delightful! Sounds perfect for a hot summer day! hi Anne, it really is quite perfect for summer! 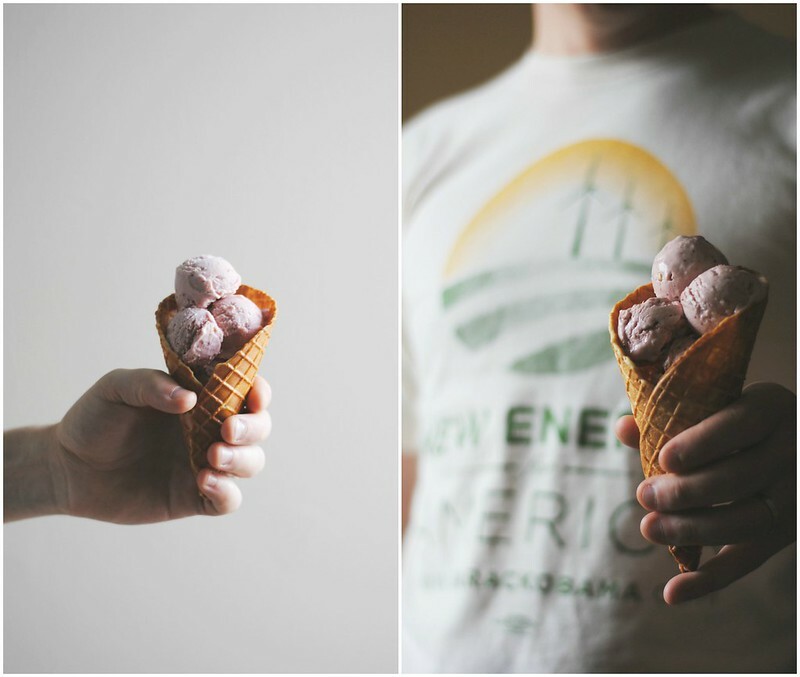 I love the idea of a strawberry & coconut milk ice cream — two of my favorite things! I’ve been making a lot of smoothies with the berries from my garden and put together a big batch of freezer jam too. I guess it’s time to make ice cream next! i’m so jealous you have berries in your garden! we’ve been making smoothies too, and it’s just so wonderful. “It pays to have a plan sometimes.” I love you for that! You are so good, these scoops are so sensibly-portioned. I wish we were neighbors so I could borrow your waffle-cone iron! Homemade must taste insanely good. I already love waffle cones with all my heart. This is just the prettiest. 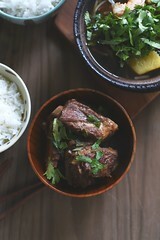 The recipe and photos are seriously gorgeous–they should be framed. Must check out that waffle cone maker now…I thought I had all of the kitchen accessories possible, but apparently not! thank you so much! a cone maker is an expense but worth it, because seriously, it’s such the perfect vessel for treats like homemade ice cream! 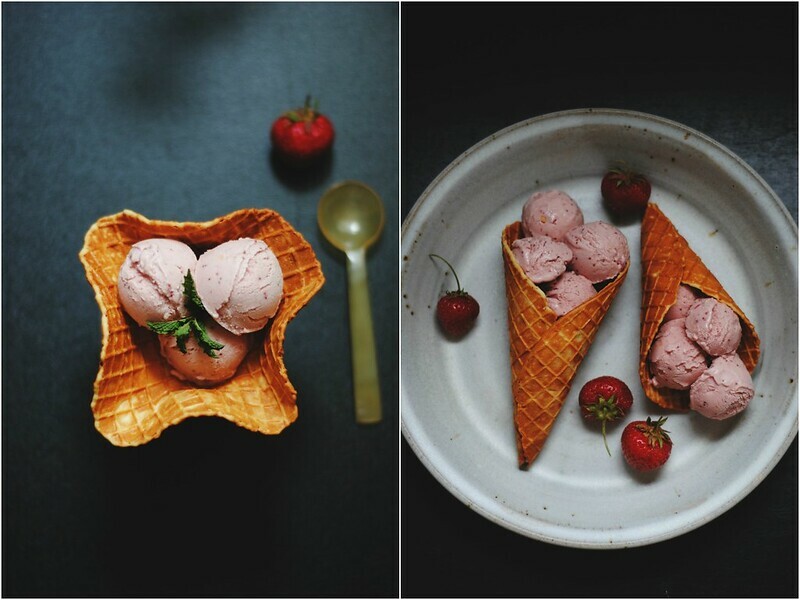 Absolutely in love with these photos and the recipe (almond waffle cones!). Such a gorgeous post, Lan. thanks Sini, all thanks to your tip about #whiteonricelive! Super-impressed by your mad waffle cones! (And your photos!) Lovely. Lovely. *gah* I need a camera upgrade. gah, i wish strawberry fields forever!! i think an investment in an ice cream maker is a must, because you can definitely control what goes into the treat… honestly, the waffle maker was a splurge and one that hasn’t been used often enough, hopefully will rectify that this summer! this is AMAZING! 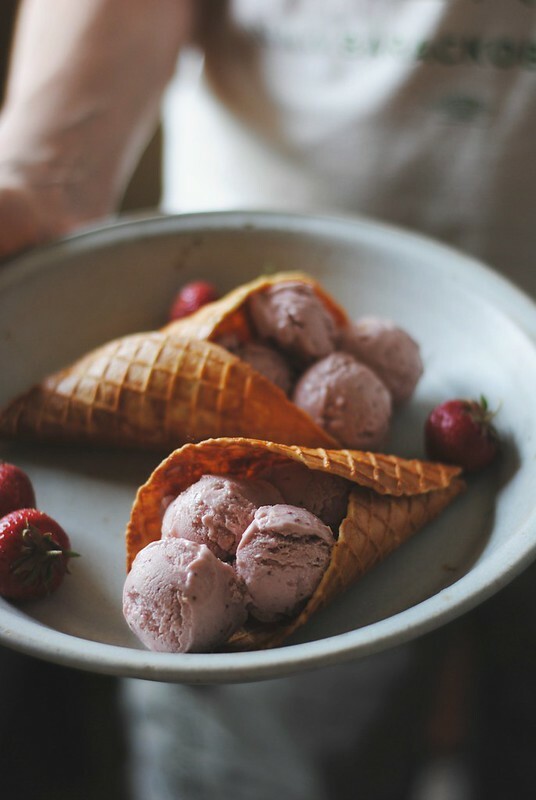 The only other place on the internets I’ve seen gf waffle cones is on Roost blog (which is now pretty hard to navigate and search, so that recipe is pretty much gone). You have re-enlivened my belief that gf waffle cones are a REAL thing that normal people can make (ok, obviously I now need a waffle cone maker…). Gorgeous photos, too. Love that ice cream recipe. Daps for dairy free. 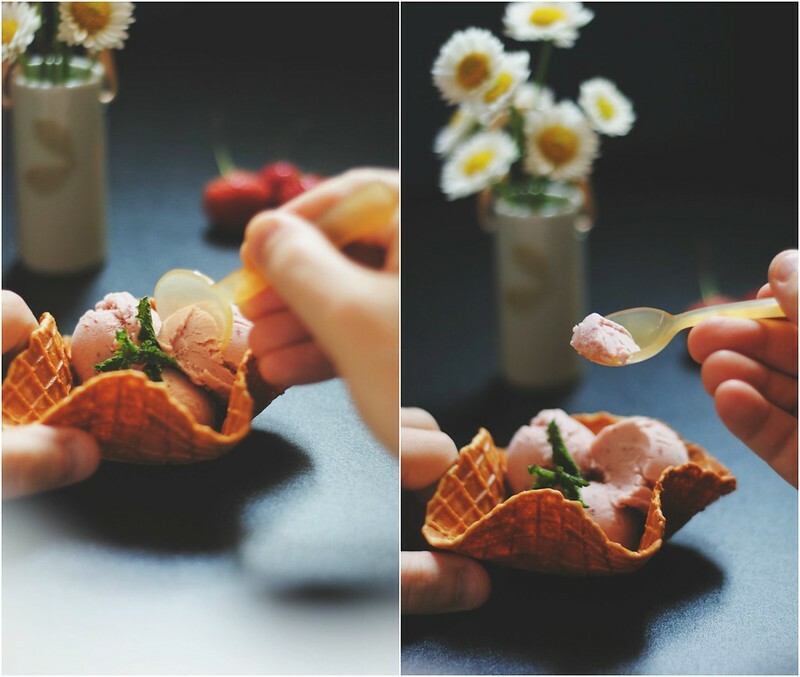 I love these photos, and those cones and ice cream look incredible! I can’t believe they’re gluten- and dairy-free. Magical! hi alanna, and welcome. thanks so much for visiting, and yes, these treats were quite magical!